JUMLA, Oct 17: It would take no more than two hours to fetch water for Gauri Sunar when she was a little girl. A resident of Tila village, she would follow her mother and aunts to fetch water. Today, she is an adult and does the entire household work of her family. And it takes four hours for her to fetch water. “Nearby water sources have all dried up. So, collecting water has become a daunting task for us,” she lamented. Similarly, collecting firewood has become an equally time-consuming job. As a kid, she remembers people gathering firewood, timber and dry leaves from jungles just within an hour. Now, it takes around five hours to get these things. “Our mothers, grandmothers were luckier. They did not have to face so much hassle,” she noted, adding that through their locality don’t have any of modern facilities, facilities that were available to their ancestors have gradually gone scarce. Another thing Sunar has noted is the gradual fall in food productivity. Yield of all kinds of crops and vegetables has declined considerably compared to the yield in her childhood days. This, she feels, is because of the change in climate. “What we have clearly noticed is that it is getting warmer. The crops and vegetables that would not grow here due to cold climate have started growing and crops and vegetables that needed cold climate are not growing as they did in the past,” she narrated. Locals believe that the signature fruit of Jumla, apple, has been affected. Its productivity has gone down, too. According to Govinda Acharya, a resident of Chandanath Municipality, earlier people in Jumla were poor due to lack of awareness. 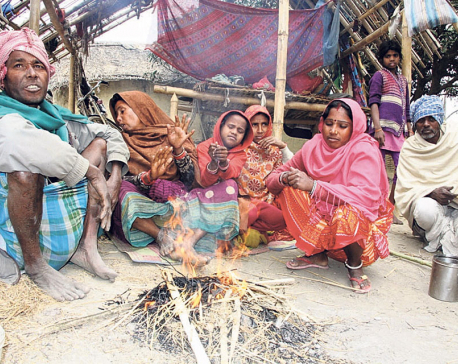 Now they are poor due to the deteriorating environment. “We have piles of problems. Because of the change in climate, we are not able to do even farming. Agricultural productivity has gone down. Youths are not living here; they are either in India or in Gulf countries,” he said. Apart from that Acharya expressed concerns over the increasing use of chemical fertilizers and pesticides in farms. He shared that decreasing agricultural productivity has mostly motivated farmers to use fertilizers and pesticides. “Nowadays the pastures don’t have grass like they did in the past. They are gradually turning dry. Because of that it has become difficult for us to feed our cattle,” Acharya laments. Concerned by the ever declining productivity of his farms, Acharya shared that he had soil of his farm tested. Lab reports concluded that the pesticides he used were very strong and were affecting the farms productivity. District Agricultural Office has declared Jumla as organic district stating that the use of pesticides in the district is near to null. According to a seasoned farmer and historian in Jumla, Ramananda Acharya, climate change is the reason behind all the hassles that farmers are facing. He said he has observed things getting worse over the years. “The most important thing to worry about is the depleting amount of snowfall in the mountains and every decreasing area of snow in mountains,” he said. During September/ October, lowest temperature in Jumla would drop down to minus14 degree Celsius. These days average minimum temperature is minus 8 degree Celsius. He said the highest the temperature would climb to in the past was around 28 degree Celsius. But nowadays 28 degree Celsius is the average temperature. “Detailed study of the impact of climate change has not yet been done here. But general people have been facing its impact over the recent years,” he noted. A two-day national conference held in Jumla with an aim to develop the district as a major tourist spot concluded on Monday. During the program, local representatives expressed their commitment to the spirit. Ratan Nath Yogi, chairperson of Tila Rural Municipality stated that all the local bodies of Jumla should prepare a master plan to develop Jumla in terms of environment and tourism in coordination with the tourism board and other concerned authorities. “This is an ideal place to develop as a tourist hub. We have great things here to see and enjoy. We have to conserve and promote the richness we have,” he noted. 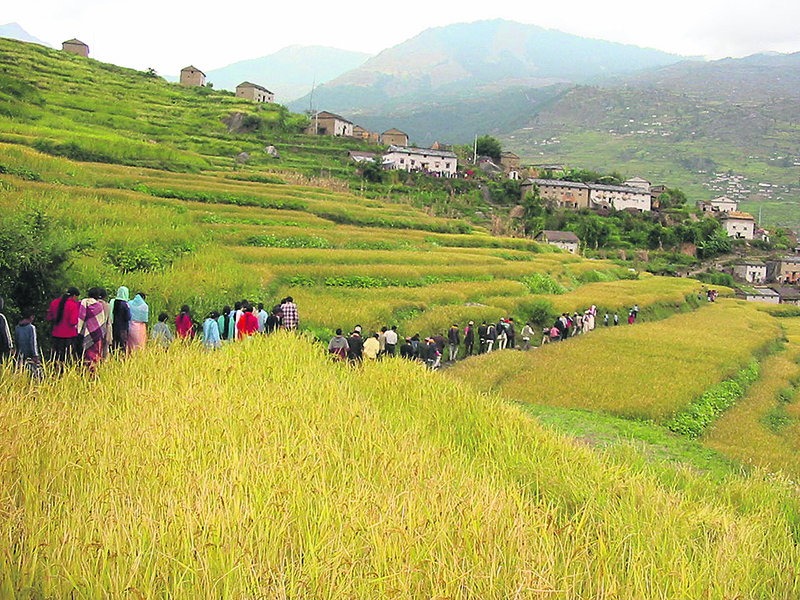 “Karnali is a virgin zone in terms of tourism potential. However, it has failed to draw attention of the tourism board,” he added. Ganga Devi Updhayaya, deputy chair of Tatopani Rural Municipality, Karnali is losing its aura and beauty due to lack of conservation of natural resources and called on to respond it. 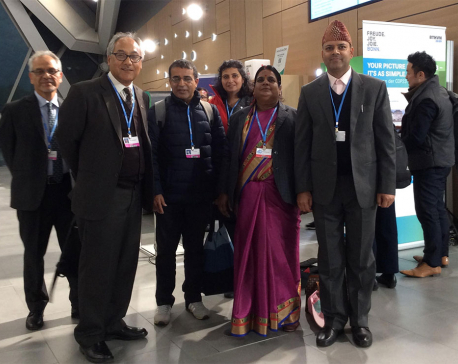 Board member of Nepal Tourism Board, Khadka Bikram Shah stated that prime locations of Karnali would indeed be part of the board’s upcoming tourism promotion plans. “Major tourist locations would be developed. Tourism board is committed to it,” he said.